Shout out to our friends at DeLallo for cooking up the incredible sauce and whole wheat oven ready noodles that MAKE this lasagna – and for sponsoring this post! It’s just, like, way too obvious, but my love for this is out of control. The feelings I have for this Super Easy One Pot Lasagna recipe — also known as Pot o’ Saucy Noodles with Cheese-Melted Goodness — are SO VERY BIG. And I’m pretty sure that I’m not even annoying with how much I love it right now. Me? Annoying with a love for food? uhh hello? never. Two bites into his massive bowl of lasagna leftovers (it’s a food blogger’s life for us), I think Bjork just about died with old-school lasagna happiness. Look, honey! It’s got good, stringy blobs of cheese! It’s not packed with obscure veggies! THERE’S MEAT! I mean, we (ehhmm, I) love froofroo lasagna, but this is not the day for my next food blogger ingredient-bomb lasagna with 800 types of roasted vegetables and five super expensive cheeses. 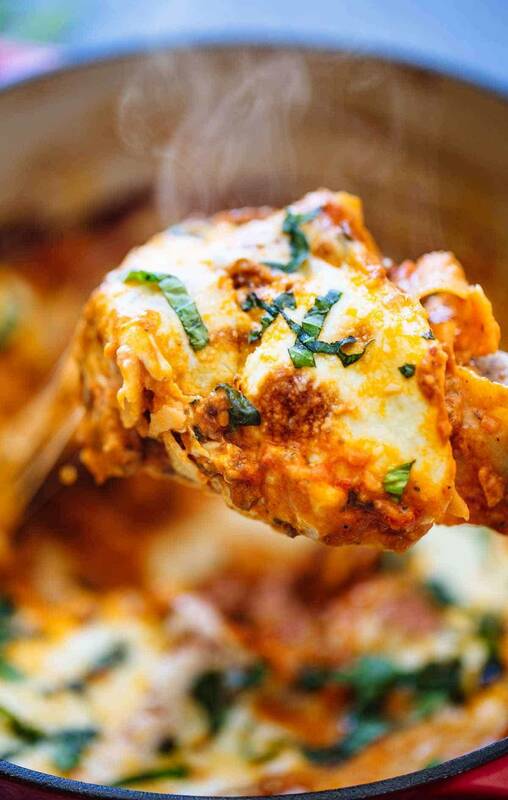 This is SUPER EASY ONE POT LASAGNA. And that’s just all there is to it. There’s most definitely a lasagna story with this recipe. The story starts with me thinking of good ideas for a recipe and getting excited about lasagna rolls // buying ingredients to make lasagna rolls // feeling really super BLEH about boiling noodles, and making filling, and ROLLING SAUCE INTO NOODLES while trying to not make an epic mess. Cute, but lemme think for two seconds: no. The lasagna story continues with me feeling a lot better about ditching my putsy lasagna roll idea and just going straight for the goods by dumping my formerly lasagna roll ingredients (bolognese! noodles! cheese!) into a large pot, and baking it all till bubbly and perfect, and eating huge messy pieces straight out of the pot with a wooden spoon. Except I never did that everrrr. The story ends with me realizing I secretly love this type of messy, saucy lasagna // secretly feeling nervous to share the pasta-cheese mess on the internet // but knowing that people love good food, and THIS IS GOOD FOOD, and so the world needs this lasagna-mess-ness to exist. The story also includes a SnapChat recipe video and Sage’s approval. Moral of the story: laziness is a virtue that leads to one pot lasagnas? Yes. That’s totally it. Second moral of the story: if you love yourself, and you love good food, you should always keep a few jars of DeLallo Pomodoro Fresco tomato sauce on hand. 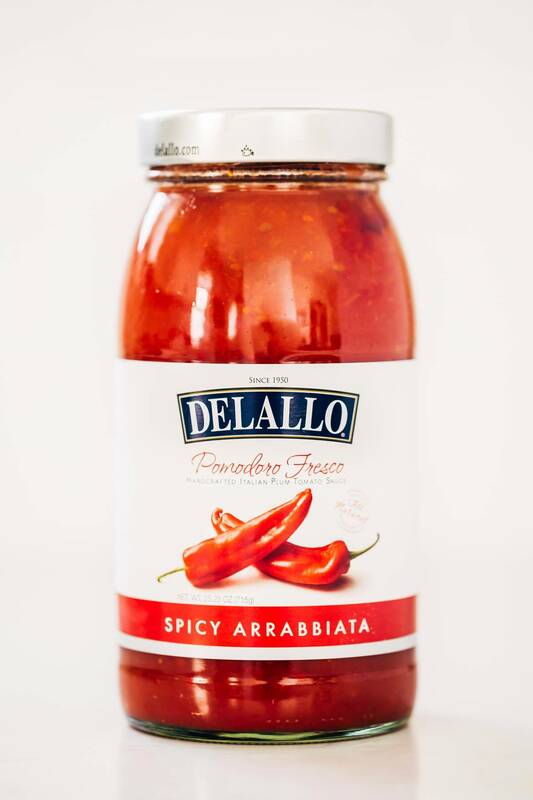 I am recommending the DeLallo Pomodoro Fresco sauces in this recipe because a) dem sauces taste really, really good, like, I don’t even really want to make my own sauce because they’re that good, b) they’re ready to use! no work! repeat: no work. and c) there are just 7 normal, simple ingredients in them which is becoming more and more important to me these days. Beautiful. Bonus: I spy no added sugar. As a person who is trying trying trying to be more aware of what they eat and avoid the super processed stuff and also acknowledge REAL LIFE IS REAL, having such a high quality store bought tomato sauce on hand is a must for me. Because –> this awaits. ♡ Say no more. This Super Easy One Pot Lasagna uses simple ingredients and can be made all in one pot! With ground beef, tomato sauce, and fresh Mozzarella cheese. Preheat the oven to 350 degrees Fahrenheit. In a large ovenproof skillet, brown the bacon until crispy. Add the shallots and carrot; saute for 5 minutes or until soft and fragrant. Add the ground beef with salt and pepper and brown until no longer pink. Drain off all the excess grease. Add the tomato sauce and wine to the meat in the skillet. Simmer for 10 minutes over medium low heat. Stir in the cream cheese until melted. Break each of the lasagna noodles into 3 or 4 pieces. Stir them into the meat mixture so they are completely covered in sauce, and arrange them so that they are all laying flat in the pan. Tuck a few slices of fresh mozzarella underneath and between the noodles, and place the remaining slices of fresh mozzarella on top. Bake for 25 minutes. If you want to brown the cheese, turn the heat up to 425 for an additional 10 minutes. Let stand for 5-10 minutes and top with fresh basil and Parmesan cheese. Thank you again to DeLallo for sponsoring this lasagna goodness! Oh my gosh. I TRIED to make lasagna rolls once. Emphasis on TRIED. it looked more like I painted my kitchen red and saucy. NOT FUN. This lazy person one pot wonder? MY JAM! DeLallo also happens to be my favorite ever, so this is happening to my cheesey easy loving face TONIGHT. Pinned! Goodness this looks good. I’m hungry and I want to eat this now. Of course in the boonies (where we live) I haven’t seen any DeLallo products. I may have to load up the next time I’m in the city. Lindsay, you always have me cracking up! I love how everything is your favorite all the time. I am the exact same way. Keep it up, sister! And this looks amazingly delish! Thanks Roslyn! 😀 We are food favorite twinsies. Yeah, it was a little meat heavy for me (as typically I’m a spinach lasagna lover!) but I still loved it!! And Bjork was in heaven. I think my entire life mission should to only cook meals that require ONE pot. Yes indeed. Sounds like a good plan to me! =) And as usual, this looks delish!! This looks fantastic. One of my favorite foods is any combination of pasta, sauce, and cheese, so it doesn’t really matter what configuration. I’ll have to check this out ASAP! So funny – I just tried making lasagna roll-ups in muffin tins and it was a major fail. Rubbery, dry noodles and I added a bunch of vegetables and made my own sauce and it was just ‘bleh’. I’ll definitely be giving this a try with some vegetarian crumbles or may just a lot of mushrooms in place of meat. So funny. I just wasn’t having it with the lasagna rolls either. Love your idea of mushrooms Mary! Thanks Erica! The bacon was inspired by my most recent tomato soup that (surprisingly) includes bacon and is wayyyyyyy delicious! So funny that you had a dream about DeLallo! It was meant to be! I love this so much. I never ever make lasagna because, frankly, I don’t want to do the work. I made it once way back with my mom and it took us all day and ended up being just okay. For the amount of work it wasn’t worth it to us. BUT THIS! This is amazing and will actually get me to try lasagna again. Thank you for your creativity. I love to come here and get inspired! Sydney! Yes. You and I are of the same kind. I love lasagna but hate making it for all the prep bowls, dishes to wash, and time it takes. Hope you like this one! This looks so amazing! One question, I am a local gal that lives in Mpls, curious where you purchase your Dellalo products? Thanks for the awesome recipe as always! Cub Foods! They have TONS of DeLallo products. I can’t find them at SuperTarget yet (sad face!) which is where I do most of my grocery shopping, but Cub has a great variety of DeLallo products – even their fresh stuff like olives. Lindsay! This is 19 types of awesomeness! BTW, just listened to your podcast with Jess Lively (for the second time) and I just love your outlook, love for adoption, and savvy biz smarts. Great interview. I’m a researcher for a living, so of course I’m the one to do this: DeLallo has a website that – as a last resort – you could order their products from. They also have a few printable coupons for their yummy-looking food. And their own store – lucky people who live near Jeannette, PA! Lindsay, you mentioned you pick up their products at Target, right? Love that tomato sauce ingredient list! I love lasagna but it is such an effort to make. This is totally doable. And only one dish to wash. Perfect! I cannot emphasize enough how much I love the reduced number of dishes with this recipe. Yay! Hi, Ginger! The noodles do not end up crunchy – they will cook from the liquid in the tomato sauce. 🙂 Enjoy! This looks sosososo good! Question: what size pot did you use? Just trying to figure out if my LC is too big for this. Thanks! Oooh, I don’t know the size off the top of my head – it’s a pretty big, deep Dutch oven from Lodge. I used a large 5 quart braising pot for my first go-round with the recipe and that worked fine. It just depends on how deep/thick you want it to be. Wow!! It not only looks good, it sounds good and it’s easy. How much better can it get?? This is a definite to do!! Sounds great. Is there a gluten-free lasagne that could be substituted? Any advice would be greatly appreciated. Hey John! Have you ever tried zucchini noodles? You can just cut the zucchini into long, thin strips using a mandolin or y-peeler (or just a knife) and then soak out all the excess liquid and use them in place of noodles. It might make this particular recipe a little too mushy since the noodles (as written) actually absorb moisture rather than weeping moisture, but worth a shot! Lindsay I love DeLallo products too and now this sauce with only 7 ingredients is on my must try list!! !And your pictures are stunning as usual! Well done to you and the folks at Delallo! This is the one-pot pasta dish of dreams!